"Review of The Mill on the Floss"
In this lamentably impoverished adaptation by Hugh Stoddart (directed by Graham Theakston), a character identified as Sophy Deane (played by Joanna David) masqueraded as one of three Dodson sisters. 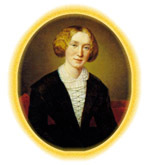 That George Eliot created a unit of four sisters is of minor consequence, since their individuality apparently merited so little concern that it was deemed fitting to amalgamate the lachrymose Sophy Pullet with Lucy Deane's mother, Susan - an expedient that, instead of giving us two for the price of one, merely effaced them both. In effect, every opportunity to avoid the danger of distinguishing one sister from another appeared to have been taken. No large buckram sleeves, fashionably immense shoulders, or architectural bonnet defined Mrs. Pullet, since there was no Mrs. Pullet. Gone with Mrs. Tulliver's plumpness were her fan-shaped cap and the bunches of unmatronly blond curls so disapproved of by Mrs. Glegg - and nowhere in evidence were that senior sister's pointedly reproving false fuzzy 'front', ill-fitting tippet, and 'chevaux-de-frise ': like their costumes, the sisters we were presented with were virtually interchangeable. The ironing out of so many of the women's sartorial idiosyncrasies was symptomatic of this production's unresponsiveness both to George Eliot's purposeful particularity, and to the social comedy that is the crucial context of her depiction of childhood suffering. The depletion and dilution of Maggie's and Tom's family (no Mrs. Pullet inevitably meant no Mr. Pullet with his musical snuff-box) characterized the depletion and dilution of the novel as a whole. There was no defeated and depressed husband for Aunt Gritty (Shenagh Govan), no wife for Mr. Stelling (Peter Gunn), and there were no gypsies for the child Maggie to run away to. Dr. Kenn was likewise dispensed with, and so - even more astonishingly - was Bob Jakin, who in the novel plays so significant a part in Maggie's life. No Bob Jakin meant, of course, no Mumps, his singular dog; but then, there was no Yap for the young Tom and Maggie, and no Minnie or menagerie for Lucy. But why should we have looked for pets, however much they contribute to the life of the novel, when there was no Garum Firs (because no Pullets) with its exotic farmyard creatures; when there was no sight, sense, or sound of beasts in fields, birds in hedgerows, or fowls in yards - no animals but a few horses to evoke the teeming life of the Tulliver world?